PCS CDMA 3.5V/29dBm Linear Power Amplifier Module The AWT6133 meets the increasing demands for higher efficiency and linearity in CDMA 1XRTT handsets. The PA module is optimized for VREF = +2.85 V, a requirement for compatibility with the Qualcomm 6000 chipset. By Anadigics, Inc. This is one package pinout of AWT6133,If you need more pinouts please download AWT6133's pdf datasheet. 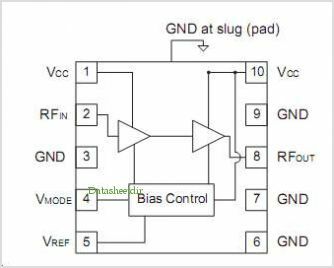 This is one application circuit of AWT6133,If you need more circuits,please download AWT6133's pdf datasheet.